(Bloomberg Businessweek) -- For the first time in two years—and for the first time under President Trump—the U.S. is set to have a chief technology officer. On March 21 the president will nominate for the post Michael Kratsios, a former venture capitalist who now serves as deputy CTO, a White House official tells Bloomberg Businessweek. Kratsios is just 32, but he’s exceedingly well-connected, having served as chief of staff at investment management firm Thiel Capital before joining Trump’s transition team in late 2016. The firm’s namesake, archconservative-by-Valley-standards Peter Thiel, had broken with the technology industry by endorsing Trump and then helping with the transition. After the inauguration, Thiel kept his day job as an investor, but Kratsios was named deputy CTO, becoming Trump’s de facto head of tech policy while the top job went unfilled. It was his first job in politics since the George W. Bush era, when he interned for Republican Senator Lindsay Graham of South Carolina while studying political science at Princeton. He’s been trying to devise policies to counter Made in China 2025, the Chinese government’s plan to develop the world’s top AI and 5G technologies. 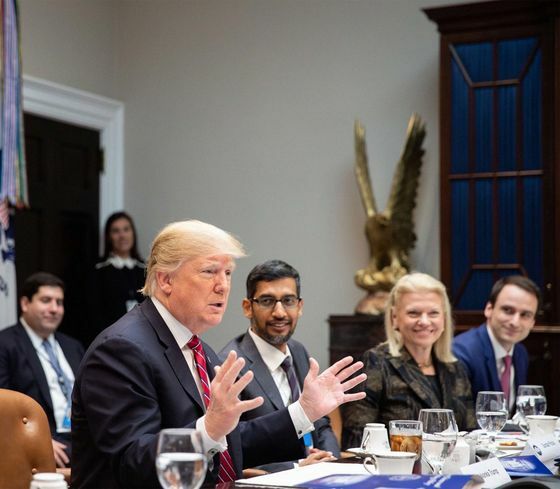 In February, Trump signed an executive order on AI that, among other things, directs government agencies to release data sets that scientists and private companies might be able to use to train machines. “They have CCTV cameras on every corner and funnel that data into private AI companies,” Kratsios says of China. “That doesn’t mean we don’t have data sets that are extraordinarily valuable.” One possibility, which the Trump administration is exploring, is to share anonymized health records that have been stripped of identifying information with medical researchers, including records maintained by the U.S. Department of Veterans Affairs. Kratsios says that could help AI and biotech startups train their software to discover new drugs and gene therapies. Even so, any government promotion of AI will heighten privacy concerns. On the day Trump signed the executive order, the ACLU warned of “potential threats to our civil rights and liberties.” And in March, a team of researchers wrote in Slate that the National Institute of Standards and Technology, which would be involved in administering the program under the executive order, had allowed researchers to train their AI algorithms using images of people who hadn’t consented to that use. The agency defended its programs, some of which have been going on since 2010, as ethical. Kratsios says the White House will protect privacy, and Chopra expects that the Trump administration will enact rules in keeping with the spirit of the Obama administration’s proposed internet Bill of Rights. “We are ultimately reaching a consensus on these issues,” Chopra says. Kratsios seems to enjoy playing the role of the moderate, even when it contradicts others in Trump’s camp. In March the president’s reelection campaign proposed the creation of a government-run wholesale market for 5G internet access, which some in the telecom industry regard as tantamount to nationalization. Kratsios rejects that idea. “We firmly believe in the free-market approach,” he says. “That is the stance of this White House.” The Trump 2020 campaign has since backtracked.